Alfredo led the group in the Four Way Test. Today we had 15 members present as well as two guests, Emma Dyer, Abigail Turner's daughter and her friend Piper McIntire. It took 38 years for radio to reach 40 million listeners and television 12 years to reach that many viewers, but it took Facebook only nine months to register 100 million users. That’s right -- one hundred million users in nine months. Today Facebook has over 2 billion users! Our club's Facebook page has close to 3,500 "fans". These are people who want to receive our content as it gets posted in our page. Whistler Get-Together remember the date of September 3 for the day at Whistler, biking or not, with lunch and a BBQ at Abigail and Jason’s house. Follow up with Abigail for details. The Project Amigo Dia de Los Muertos dinner fundraiser will be on October 21st at the Helenic Centre. Tickets will be $50 and the event page will go live shortly. President Alfredo thanked Past President Cleopatra for serving our club for the past 2 years. 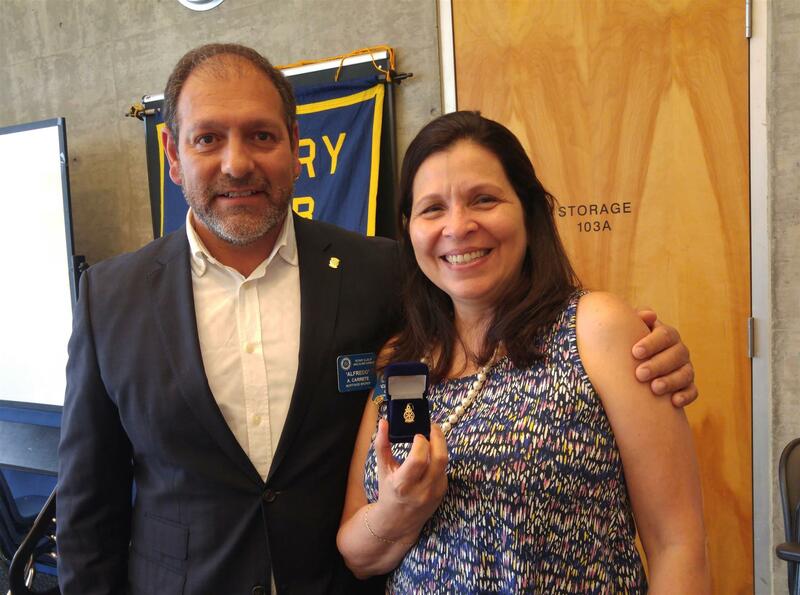 She was presented with a Past President Rotarian pin. 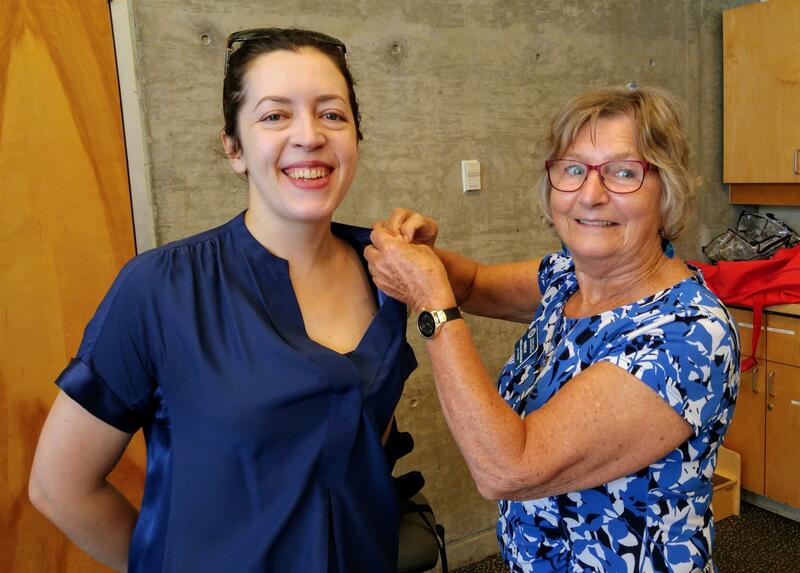 Sheila Anderson inducted our newest member, Natalia Lysova. Natalia comes from a Rotarian family and she was also a Rotary exchange student. Larry Belsito and Gary Chomyn were presented with Tom Harris awards for the incredible work they do for our club and the community. Our guest speaker today was Tom Smith. 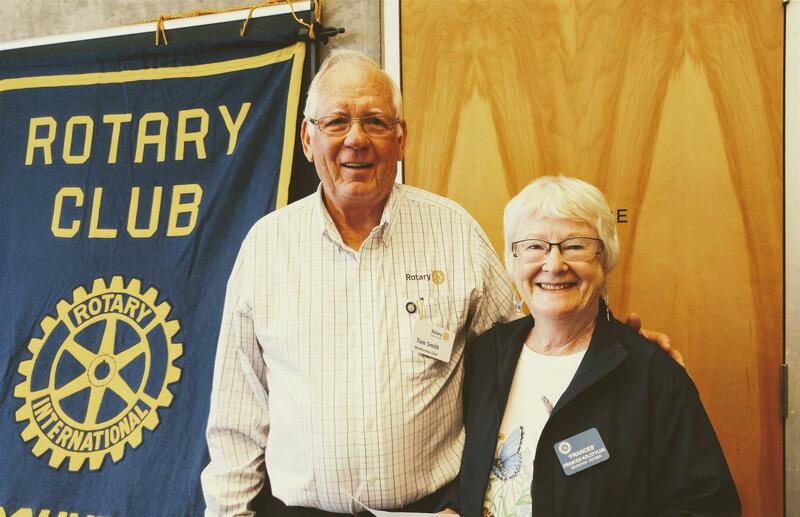 He is a member of the Tsawwassen Rotary Club since 2002, and past member of the Vancouver Rotary Club. Tom is a Past President of his club and former Assistant Governor. Currently he is the District Membership Chair and Paul Harris Society District Chair. He is the Social Chair in his own club. And recently appointed to the TRF Canada committee for helping manage the government grant of $1,200,000 per year for 5 years. Tom is a curler, bridge player and a cyclist. He and his son, Steve, run a sales agency. He is married to Stephanie and also has a daughter, Wendy, who is a teacher. And last but definitely not least, a six year old grandson, Noah and a two year old granddaughter, Amelia. His presentation was on the crucial topic of Rotary membership. he provided our members with several very innovative ways of attracting and retaining members. September 6 - Bob Blacker, Education and Literacy. September 13 - Business Meeting. September 20 - John Charbonneau, Reverse Mortgages.